In January, 2010, as Dr. Sinclair prepared to leave for a conference, she received a phone call from her brother-in-law. 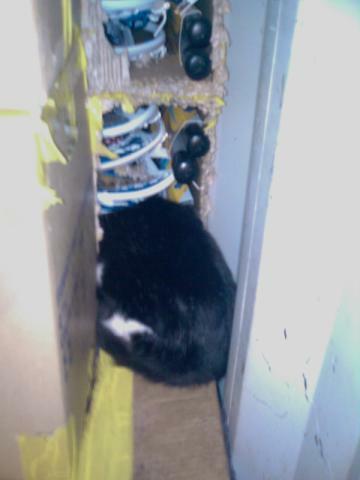 He was working at a warehouse in Baltimore, and when his crew opened a box of lacrosse sticks that had been shipped from Taiwan, they found a cat inside! This crate had been shipped from Taiwan six weeks earlier and the seal was intact. It had not been opened in all that time. 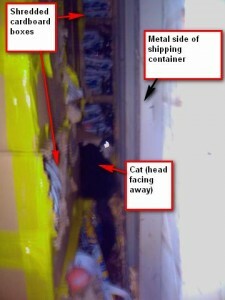 The little black and white cat was crammed into a narrow space within the crate and he was terrified. The workers managed to get him out of the crate and into a smaller box for safekeeping. The inside of the crate was shredded; he had probably survived by licking condensation, eating cardboard, and perhaps finding and eating an occasional bug. The warehouse management did not want to get involved with a stowaway cat, so Dr. Sinclair’s advice was sought. Since she was leaving in a matter of hours, Dr. Sinclair contacted PetER in Towson to see if they would care for the cat in her absence. A flurry of phone calls between Dr. Sinclair, PetER and various health departments ensued since the cat’s health status was unknown and his international status complicated things. Thankfully, Taiwan is a rabies-free country. 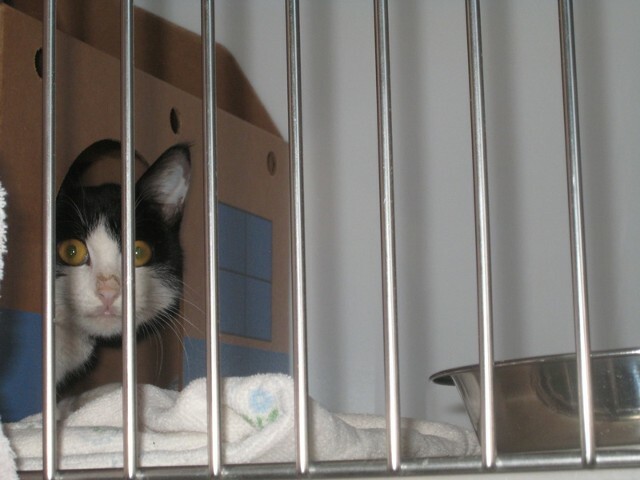 Dr. Sinclair’s brother-in-law transported the cat to PetER where he was evaluated. The poor fellow weighed only 3 1/2 pounds, which was probably less than half of what he should have weighed. He was covered in fleas. Bloodwork run at the ER showed him to be moderately anemic and to have a mild electrolyte imbalance. He was immediately placed on IV fluids and was also bathed, dewormed, and given a rabies vaccination. After a four day stay at the ER, Dr. Tuzo picked up the little cat, whom we dubbed Tai, and brought him “home” to Cat Sense. He moved into a condo in boarding and was kept sequestered from other cats. He had minimal contact with staff members and was allowed to gradually adjust to his new surroundings. In his condo, he had a “Hide, Perch & Go,” which is a cardboard “cat house” that converts into a carrier. These are often used in shelter environments to help shy cats feel secure by giving them a place to hide. He was fed very small meals at first since he hadn’t eaten in so long, in order to keep him from experiencing “re-feeding syndrome,” which can lower a cat’s potassium and phosphorus levels and may cause red blood cells to burst, creating severe anemia. Gradually, the caretakers began to interact more with Tai and after about three weeks, his condo was opened and he was allowed to explore the room. After five weeks, he was neutered (welcome to America!). He became more secure with each passing day and began to play with toys, but still wouldn’t allow anyone to touch him. He did make a friend, though. Shaky, our official boarding mascot, began to visit Tai through a crack in the door. 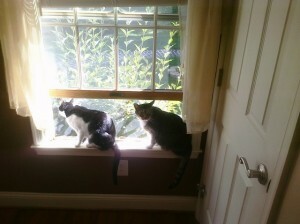 They would play “footsies” and Tai really looked forward to seeing Shaky. Tai stayed with us at Cat Sense for four months; Cat Sense staff and veterinarians all took time to sit quietly with him in boarding room #2 to help his socialization. Eventually, Tai had to move on. though several caring clients offered to adopt Tai, he went to his forever home with Dr. Sinclair, who had recently said good-bye to two cats of her own. She began by keeping him separated for a few days in a cat condo at her house. Later, he was given a room of his own. Dr. Sinclair spent many hours sitting with Tai in his room so that he could become acclimated to his surroundings and new family. She slowly introduced him to her other cat, Bean, and while Bean was less impressed at first, he soon came around. Now Tai has free roam of the house. He and Bean are best buddies. He loves to play, spend time with Dr. Sinclair, and has become a real lap cat. She is even able to pick him up for short periods. He is truly a very lucky cat. See the next section for photos of this handsome boy!